Windchill Weibull - Relex Italia S.r.l. also called life data analysis, estimates a product’s important life data characteristics — including reliability or probability of failure at a specific time, mean life and failure rate. To accurately predict performance over a product’s life, it’s essential to gather and analyze life data from a variety of sources, including design and development, testing, field studies and customer returns. PTC Windchill Weibull predicts failure behavior using data from all phases of a product’s life. The software enables manufacturers to track reliability growth, analyze product degradation, plan product testing procedures, calculate optimal maintenance periods and perform warranty forecasting — in one powerful statistical package. Comprehensive Life Data Analysis. Windchill Weibull supports all types of life data, including exact, censored (suspended), interval and free-form data, which may be entered as single data points or groups. Supporting all major distributions and estimation methods, Windchill Weibull calculates and plots a number of outputs including probability, PDF, reliability and unreliability, failure rate, and contour plots. Best fit distribution, competing failure modes and non-parametric life data analysis is also supported. Import data sets from external sources, or generate data sets from Windchill FRACAS and link analysis results back to Windchill Prediction or RBD. Advanced Utilities. Windchill Weibull supports a range of utilities and related functions to enhance your analyses. Complete Reliability Growth Analysis using the Duane and Crow/AMSAA methodologies. 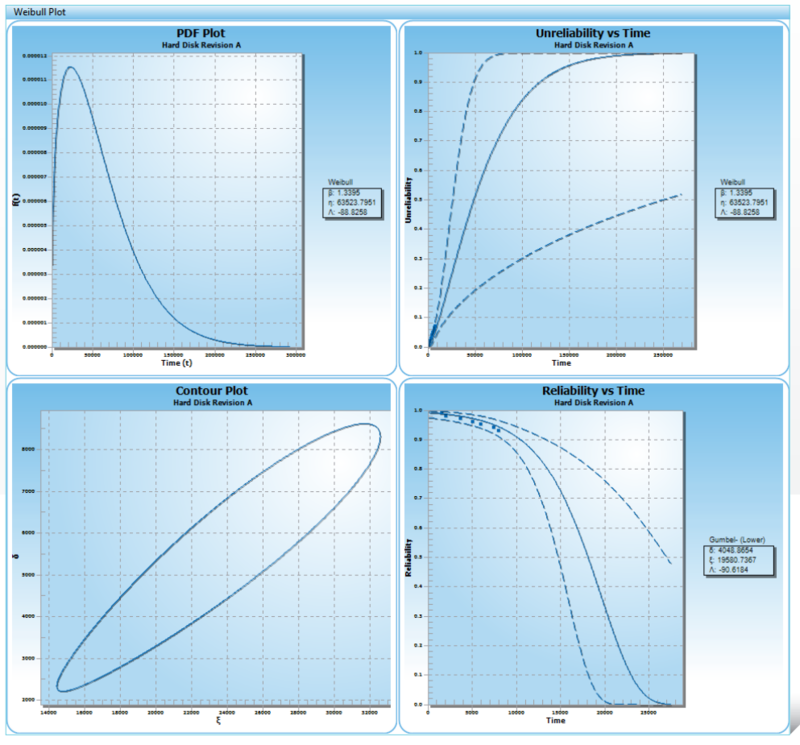 Use degradation data methodologies to estimate failure times from the rate of decline of parts or components. Perform warranty forecasting using sales and returns data. Perform test planning calculations given a desired reliability level, time frame, or number of units. Windchill Weibull also includes a General Statisics Calculator that provides a wide range of useful statistical functions. Professional Outputs. Windchill Weibull is supplied with a range of industry standard reports and graphs, including multiple data sets. Easy-to-use Report and Graph Wizards provide complete user customization of outputs to fit your specific needs, without the need for IT experts. Once complete, reports and graphs can be printed or saved directly to Microsoft Word or Excel, and Adobe PDF.